Learn more about Dracula’s connections with Whitby and how Bram Stoker was inspired by the town to write his famous novel. Unless you’ve actually read the timeless classic ‘Dracula’ by Bram Stoker you may not know that much of the inspiration for the novel came from right here in the town of Whitby. Stoker was directed to the town by a good friend in 1890 after he became exhausted from work. He apparently fell for the place immediately, later saying that the atmosphere and sites such as Whitby Abbey and the graveyard of St Mary’s Church gave him the first creative sparks that led to the ‘Dracula’ novel. While staying in a house on the West Cliff, Stoker got to meander around the town and the harbour for a week before his family joined him. During this time he got to hear many stories, myths and legends about the area, some of which ended up being included in his novel. For example, the book starts with Dracula traveling from Russia to London on a schooner that becomes shipwrecked off the coast of Whitby. This tale was told to him during his stay and is based on an incident that actually happened earlier in the 1800s. Similarly the form of the large black hound that Dracula takes as he enters Whitby is taken from a legend that can still be heard in some of the old taverns of the area. Stoker’s love for Whitby and the surrounding area is evident when you read the words of his novel’s characters, such as Mina. One of the book’s main characters, Mina keeps a journal where she describes many of the scenic areas in and around the town as they were at the time Stoker was there. When he saw something he liked, he put it in the novel. There are short descriptions of Whitby and the surrounding area throughout the Dracula novel however it’s the opening chapters that let you know you’re definitely in Whitby. As mentioned earlier, Bram Stoker stayed in a house located on the West Cliff. From there he could look out to the East Cliff with the Abbey and St Mary’s Churchyard standing proudly, yet eerily, on top; the view that set the scene for his dramatic opening chapters. Tate Hill Sands, where Dracula is written to have come ashore, depicts the start of his route into the town, while the 199 steps leading from the sands to the cliff top are most definitely real and worth the iconic climb. If you stand outside the Royal Hotel on the West Cliff today you can get the same view as Stoker would have got 125 years ago. 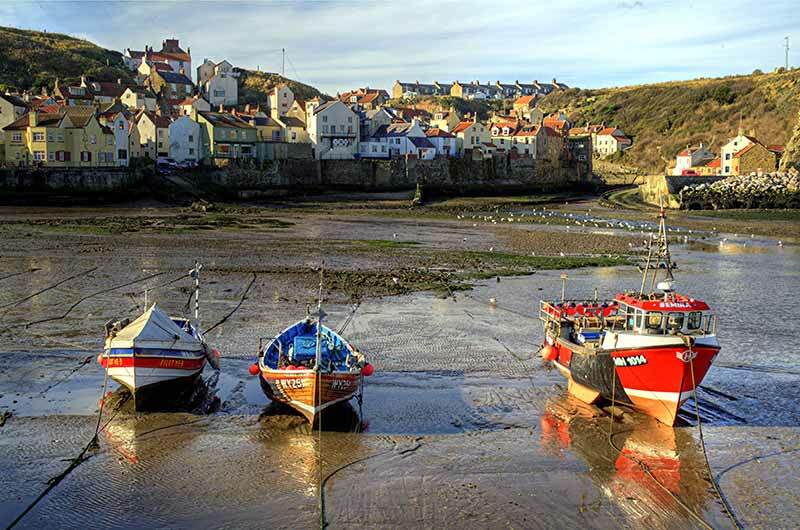 A few things have changed over the course of the last century but you can easily relate the descriptions in the novel to the beautiful scenery of Whitby. During the 1990s one of Whitby’s long term residents, Harry Collett, thoroughly researched the connection between Bram Stoker and Whitby before deciding to offer informative guided walks to the thousands of Dracula fans that visit the town each year. Today, Harry is still conducting his walks, dressed in traditional Victorian costume of course. He now insists however that the walks happen after the sun goes down…it is a tour of Dracula’s Whitby after all. Harry’s walks are ideal if you want to know the real facts about Bram Stoker, Dracula and Whitby. During the tour you’ll get to hear the myths and legends that Stoker would have heard from the fishermen and labourers of the time; the myths and legends that helped to create his timeless novel Dracula. Whitby will always be associated with Bram Stoker’s Dracula and thankfully the residents of the town have found numerous ways to keep the connection alive. From the coffin-shaped chocolates found in the local fudge shop to the fake tomb stone depicting the final resting place of Dracula, there are remnants of the fictional character everywhere you look (they may not always be obvious though so look closely). If you have a spare hour while in Whitby, and a strong heart to go with it, you can always take part in the Dracula Experience. Here you get to skulk around a series of pitch-black tunnels while being ‘attacked’ by the local ‘ghouls and ghosts’. Scary yet a lot of fun, this experience isn’t for the fainthearted. If you’re a true fan of Bram Stoker and Dracula then you might want to attend one (or both) of the bi-annual events that celebrate his life and works. To many people Whitby is a sleepy town on the Yorkshire Coast but as you can see it has an interesting history. The connection between Whitby, Dracula & Bram Stoker is undeniable but even if you’re not particularly interested in this aspect of the town there are still plenty more things to see and do while visiting. If you have more information on Dracula and the connections to Whitby then please comment below. Loving Whitby Dracula? Pin it! Thanks for the info, it was very useful when researching my WHITBY | GOTHIC piece of artwork. If you like fact-based fiction, try reading my novel, ‘Moon Rising,’ in which a Whitby fisherlass made good reflects on the man she met some twenty years previously – a man escaping from the pressures of his life in London. The man is Bram Stoker… ‘Moon Rising’ was a bestseller when first published in 2000, and is now available as an eBook from Amazon and other online bookstores.